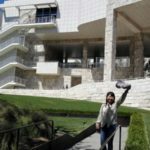 Dr Jing Han, Professional Fellow, Getty Conservation Institute (GCI). After completing my doctorate at the CTCTAH last year, specialising in the identification of textile dyestuffs, a couple of months ago I came to the GCI and began to do research on lacquer. As the lacquer research enters the next stage, I am very honoured to join this excellent team and cooperate with fellows in different countries to carry out research on the degradation and cleaning of lacquer. My primary task is to characterise the chemical components of various lacquer samples. 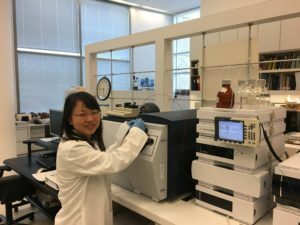 The main analytical technique I will use is liquid chromatography coupled with diode array detector and mass spectrometry (LC-DAD-MS). Does it sound familiar? Absolutely. The knowledge, skills and insights I obtained during my doctoral research at the CTCTAH provide a solid foundation for this work. During the first few weeks I have been learning lacquer analysis and grasping the use of mass spectrometry, a base from which I will be able to explore the unknown. Challenging but exciting! In addition, I still have textiles in mind for sure, and have already learned about a wonderful dyestuff collection here at the GCI. I will also have more chances to communicate with textile researchers, curators and conservators in the US. the future is full of potentials…. 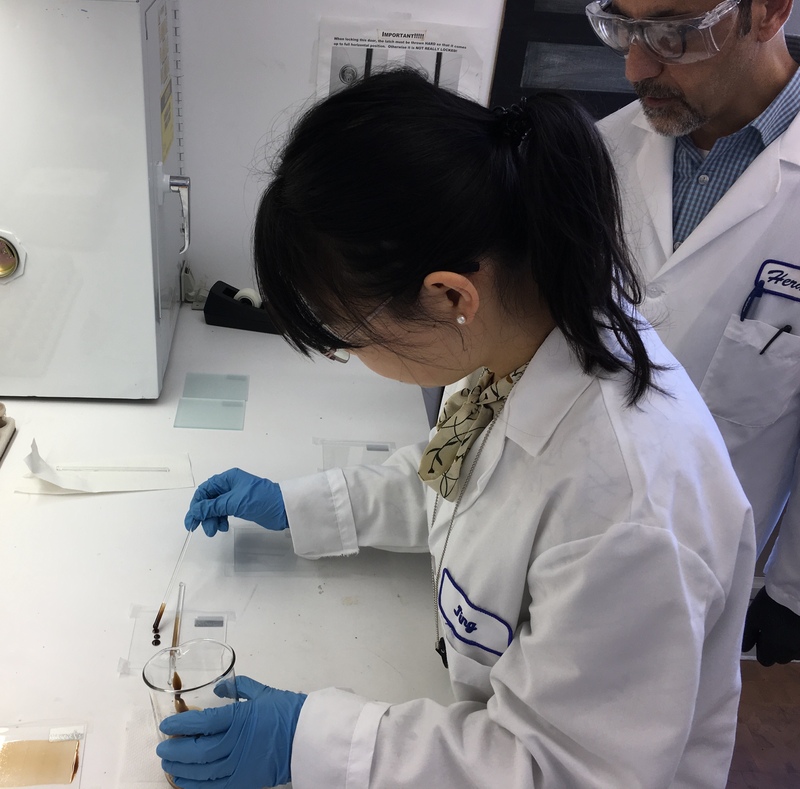 Making lacquer films with Assistant Scientist Herant Khanjian. These samples will be used for cleaning tests. © J. Paul Getty Trust. 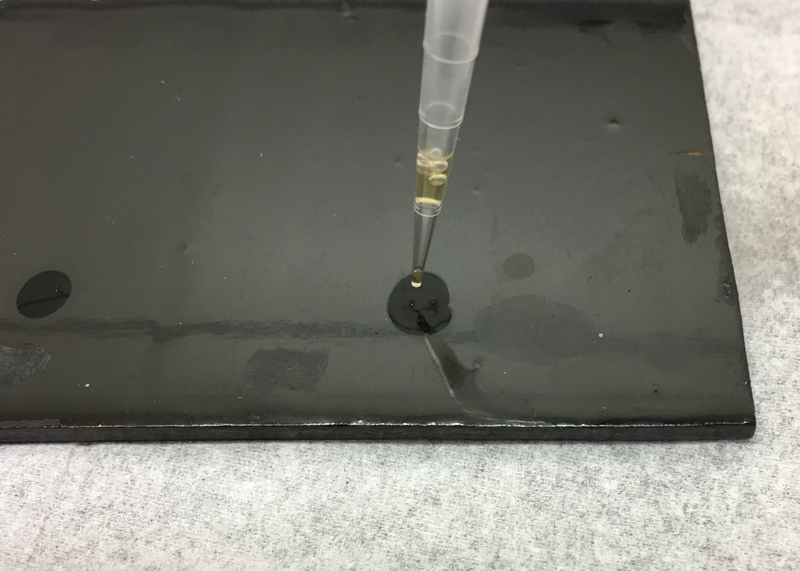 Light-aged lacquer surface can be so vulnerable that even a drop of deionised water dissolves some of its components. © J. Paul Getty Trust. Testing standard lacquer components by LC-DAD-MS © J. Paul Getty Trust.